Drupal is a very flexible content management system for building websites. It provides many great features out of the box which enable us to build comprehensive sites without writing any PHP code. It also provides features to add more functionality through the use of modules. By default, the Drupal node types are an article and a page. This might be good for basic sites, but if we plan on having a more complex website, we’ll want to add different node types. We can even define those by writing a module! In this article you’ll see how to write a custom Drupal module which will install new node types using the Drupal hooks and API. Let’s start by creating the basic structure of a module in which we’ll create our new content type. productcustomtype.info – will contain the information about the module so that Drupal will recognize it and show it in the list. productcustomtype.install – will have details about things you are going to install or uninstall for the module. productcustomtype.module – will contain code to implement the Drupal hooks used by the module. The above simply defines some parameters for our module so Drupal can use it and display the information about our module. Once this is done we should see our module in the module list as shown below. But don’t enable it just yet – we’ll do that after the next step. Once we have the basic files for the module in place, we can start writing code for installing the custom node type. The first hook we need to implement is hook_node_info. Using this hook, a module can define one or more node types in Drupal. The hook implementation returns an array defining the new node type which the module is going to add. The implementation returns an array defining a new node type product along with some of its properties, such as its name, description, if it has a title, and base (which is used in different hooks for this content type). As we have defined that this node type has a title, we need to show the title text field when the form for this node is displayed to add content. To do this, we will have to implement the hook hook_form. We simply use the Drupal API which gives an implementation of hook_form and adds a title field provided the node definition has the has_title attribute set (which we do have set in our case). Once we’ve got this done, we need to implement the hook_install hook to add the body field to the new node type. We first save all of the new node types created by different modules (including ours) by calling the Drupal API node_types_rebuild() function. Then we get all of the node types and call node_add_body_field() on our type to add the body field. If we add a new product, it will also be seen on the Drupal home page. we first find out all of the node IDs which are nodes of our installed content type. Once we have collected the IDs, we use the API function node_delete_multiple() to deletes multiple nodes. Then we use the node_type_delete() function to delete our node type. Now if we uninstall our module, all of the nodes of our type and our type itself should be deleted. Once we’ve added the new node type we have functionality similar to that of a node. But what if we want to add more fields depending on the node type? 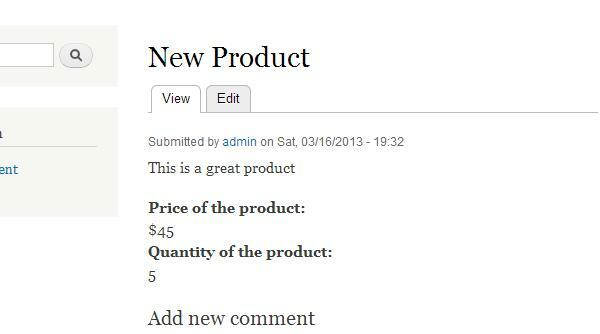 For example, if it’s a product type then we might want to add two more fields like price and quantity. For this, we have to first create the fields and then then create field instances on our node type. We write two new functions in the productcustomtype.install file to define the fields and the field instances. We then create a function add_custom_fields() in productcustomtype.install which will read the array from and create the fields and instances. Now we can just call the add_custom_fields() function in productcustomtype_install() so that the fields and field instances are installed when the module is installed. We also need to update our productcustomtype_uninstall() function to remove the fields and field instances. The Drupal CMS provides many useful hooks and a powerful API which allow us to perform various customizations. In this article we were able to create a completely new node type which will appear in Drupal’s content section. And using Drupal’s API we also attached fields to this new node type so that anyone can easily add content using the new node type. So have fun creating your next new node type for your Drupal site.